Setting aside a once-in-a-lifetime invitation to a White House ceremony at which you would be one of 10 Asian American/Pacific Islanders nationally honored by President Obama is no small thing. 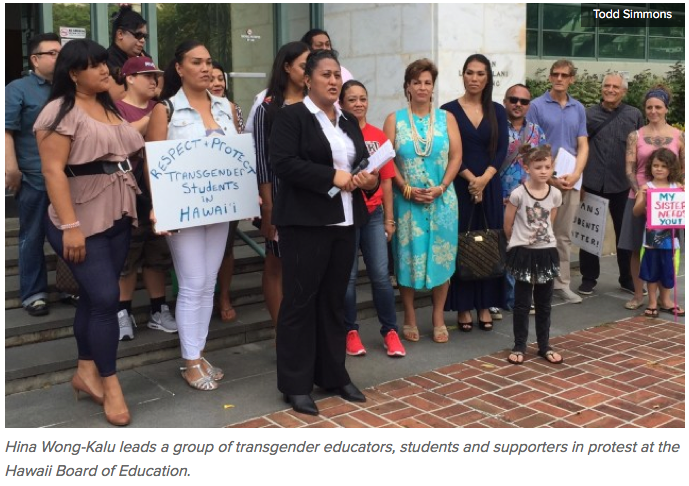 But that’s exactly what Hina Wong-Kalu did this week so that she could personally express her frustration with the Hawaii Board of Education’s continued lack of specific guidelines governing how public schools and educators interact with transgender kids. 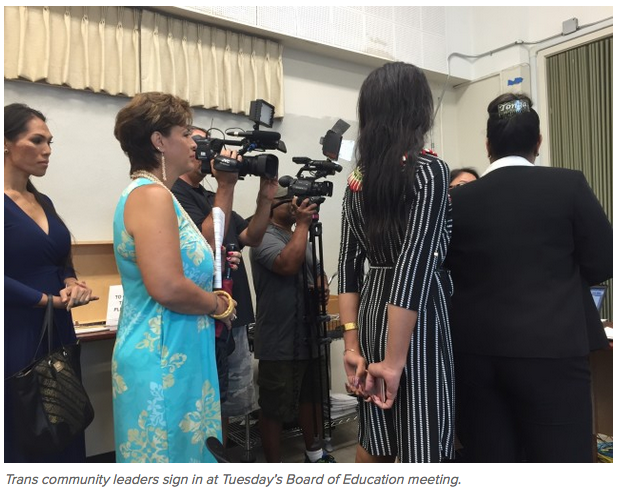 The transgender educator, hula instructor and subject of the award-winning documentary Kumu Hina, Wong-Kalu led 15 transgender community members and supporters in a Tuesday afternoon press conference at the Department of Education and civil discussion at a subsequent Board of Education meeting, where they delivered more than 5,400 petition signatures in support of their position. Transgender visibility has reached heights in recent years that few ever imagined possible. The very public transitions of Bruce Jenner to Caitlyn Jenner and Chastity Bono to Chaz Bono, television series like Orange is the New Black, Glee and I Am Jazz and the popularity of celebrities such as Janet Mock and Laverne Cox have created wider cultural recognition of the obstacles most transgender individuals face in simply living their lives. That visibility also has birthed a growing and righteous sentiment that they deserve to be covered by civil rights laws and anti-discrimination policies. One of the most vivid illustrations of that is the ongoing controversy in North Carolina over HB 2, a hastily passed state law that wiped away discrimination protections based on gender identity in the few jurisdictions where local ordinances had been passed. Scores of conventions and big concerts starring top performers have been cancelled or moved out of state, along with numerous plans by big businesses to expand or start new operations in North Carolina. In a particular blow to the basketball-crazy state, the NBA announced in late April that it may pull its 2017 All Star game from Charlotte if the law is not repealed, while the NCAA said it may follow suit in eliminating the state’s ability to host 2017 basketball tournament games. That was followed by an estimate by Time Warner Cable News that the law has so far cost the state roughly $77 million in investments and visitor spending and about 1,750 jobs. But in a cultural environment where so much more finally seems possible for transgender individuals and the trans community, there are daily reminders of how difficult life can be for some of its most vulnerable members, both nationally and here in Hawaii. In mid April, the mother of a Palolo Elementary School second grader went public with her daughter’s challenges. Wendy Taylor said young Kailey suffered completely preventable embarrassment in front of classmates and difficulties with school leaders who were unprepared for how to deal with a transgender student. At Tuesday’s protest, Wendy said things are better now, in part because of the light shone on the case through local and national media coverage, including CNN. School leaders know that others are watching, she said. Around the same time that Kailey’s story emerged, Jennea Purcell released her own story with local documentary makers Dean Hamer and Joe Wilson, detailing her challenges, as a senior last year, at Kahuku High and Intermediate School on the North Shore. Purcell had transitioned from her prior identity to Jennea the previous school year, but said a new school principal didn’t support the change and refused to allow her to wear the regalia designated for women in the Kahuku commencement ceremony. Heartbroken, she opted not to take part, missing her own graduation. The seven-minute video of Jennea launched on CivilBeat.com had drawn more than 26,000 views as of Tuesday. Her story fueled the Change.org petition and signatures that Wong-Kalu brought to Tuesday’s press conference, which included not only support from across Hawaii, but from Australia, Canada, Japan, Brazil and numerous other countries around the world. “There’s no specific training, and people just don’t know how to handle their situations in school,” he said. The fallout from such situations can be severe, Ramos said. He has dealt with situations that have included discrimination, falling grades and school attendance, suicide threats and actual suicide. In other situations, he’s seen students rejected by their families and peers gravitate to questionable adults in the community and even turn to prostitution. “Hawaii’s not exempt from any of that,” he said. Ramos, Wong-Kalu and other trans community leaders said they’re seeking three things from the Board of Education. First, establishment of guidelines that ensure the safety and success of transgender students — guidelines that provide more help to administrators and teachers in navigating an area that just a few years ago was treated far differently by most schools. Second, training for school employees to enable them to successfully implement policy and guidelines. And lastly, enforcement. In other words, guidelines that actually provide protection rather than just collect dust on a shelf. After the media availability, protestors made their way to the Board of Education meeting room and took a collective breath before stepping in, press cameras trailing. And they were met with aloha. Hawaii State Teachers Association President Corey Rosenlee came over to shake hands and later offered supportive comments from the podium. Board member Patricia Halagao congratulated Wong-Kalu on her White House honor. Vice Chair Brian J. DeLima asked about the group’s petition, making sure there would be copies for individual members’ review. For men and women who have too often found themselves outcasts, marginalized by schools and other social institutions that are legally obligated to treat them like everyone else, the simple civility of the moment was important. Though past calls for help haven’t resulted in the guidelines, training or enforcement transgender people seek, their appearance at Tuesday’s meeting seemed the start of a new dialogue, one where their concerns may finally be heard. And acted upon. With so much at stake in the day’s events, Wong-Kalu said declining the White House invitation for the ceremony, which takes place today, was not a tough call.